Man’s fascination with space travel has led to several outstanding developments in the scientific and engineering arena. One of these has been recently revealed by a Montreal-based innovator, Charles Bombardier. 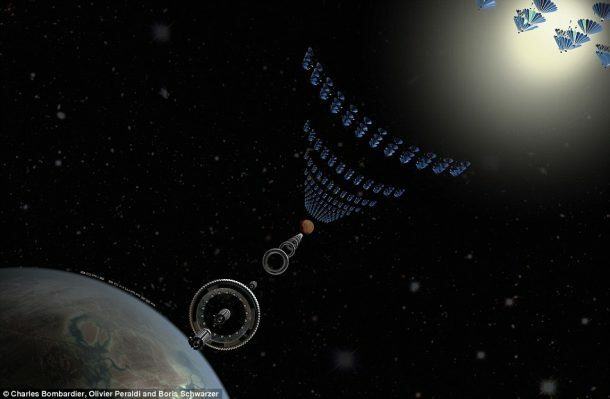 He has developed a unique space travel concept called Solar Express, which will theoretically be able to transport passengers and payloads between planets faster than ever before. Solar Express, in theory, is capable of moving at roughly 1 percent the speed of light, which is equivalent to about 3,000 kilometres per second or 1,864 miles per second. This would, in essence, drop the travel time between Earth and Mars to less than two days! 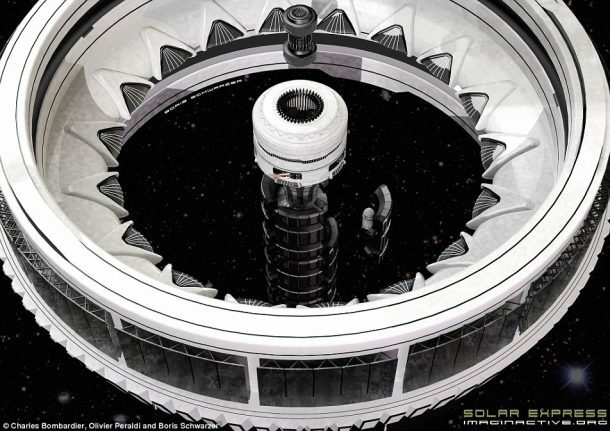 Solar Express is designed to entail a series of aligned cylinders which are roughly 50 metres or 164 feet in length. Six of these cylinders will be able to link together in a straight line (just like an ordinary train) and blast through space. Initially rocket boosters will be used to launch the train while keeping a small amount of fuel in reserve in case of manoeuvring. After the launch, the initial momentum will be enough to drag the train through space, and it will be able to slingshot around celestial bodies to gain speed without needing more fuel. For energy harvesting, massive solar arrays will be located along the train. The solar energy will then be transferred by laser to super-capacitors. The harvested water on moons and comets will be used to provide water to the riders, along with creating hydrogen and propellant for the ion thruster main propulsion system. Once the train is set in motion, it would never stop. Smaller crafts would attach and detach to gather supplies and offload passengers. 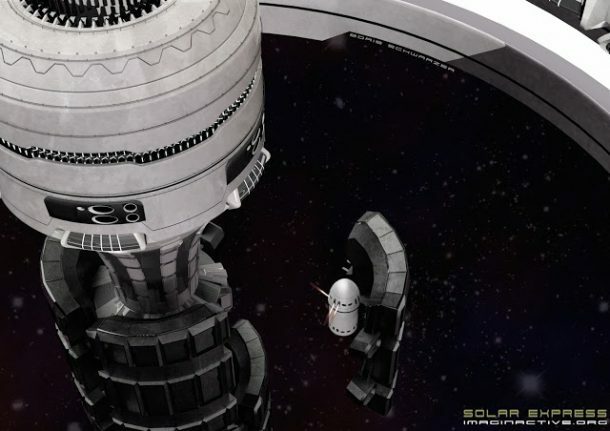 This aspect will cut down costs considerably, though the up-front construction and lift off cost would be quite high! To put things in perspective, a trip from Earth to the Moon using the train would merely take 2.13 minutes, while a trip to Mars would take about 37 hours (less than two days). A trip to Neptune, which took Voyager 2 about 12 years would take about 18 days for the train! Although there are still a lot technical gaps and questions such as how to control such a fast vehicle, how would the transfer of people and goods occur from the moving craft, how to get it hitting such high speeds etc. ; but using imagination to come up with such interesting theories is the only way we can move towards more unconventional methods of space travel. Would you like to have a ride on this cool space train?